A kaleidoscopic world of luminous colours, shifting shapes, unfamiliar textures, esoteric ingredients, and rich flavours, chè is a fascinating sub-category of Vietnamese cuisine. Chè can be translated as ‘dessert’, but in reality it’s so filling, so nutritious, that chè is a meal in itself. The sheer variety of chè and innovative use of ingredients is, I think, unrivalled in any other area of Vietnamese cooking. Tropical fruits, nuts, beans, grains, seeds, flowers, roots, and vegetables all play their part. But the central component is sugar: chè is sweet. 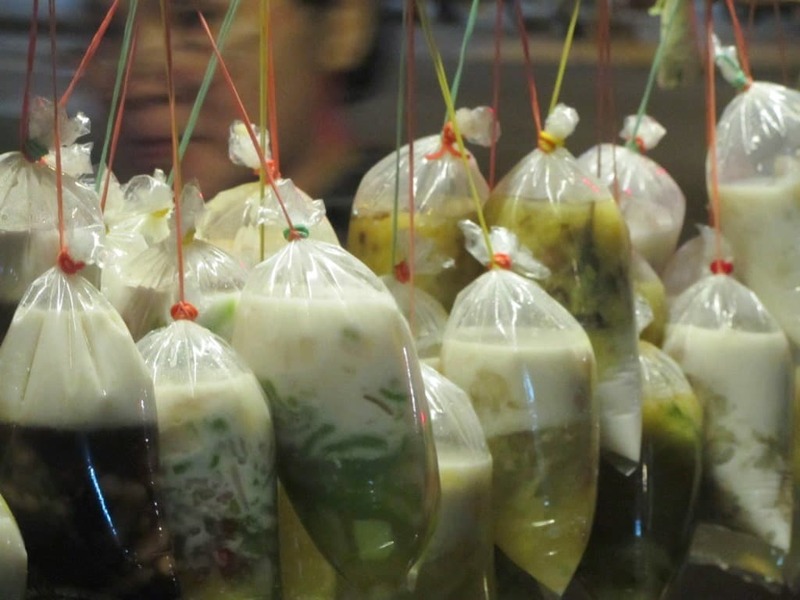 As such it appeals chiefly to Vietnam’s burgeoning youth; nowhere more so than in Saigon, where the humid tropical nights make a sweet, iced dessert that much more appealing. In a city where everyone seems to be a teenager, I spent two weeks on a sugar-high, scouting out 9 of the best chè joints in town. Below are 9 great places to eat chè in Saigon, all of which are open in the afternoon and evening. Click on any name from the list to read more about it. 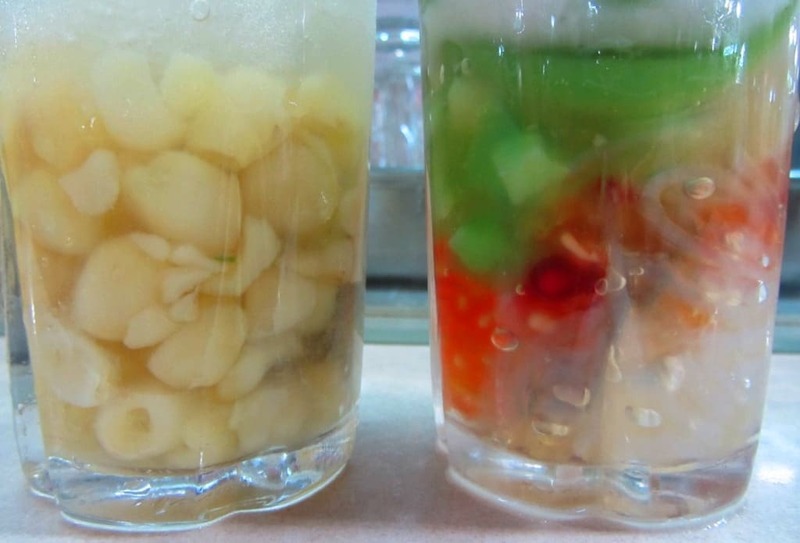 These places have been serving chè for many years, and they are masters of their trade. The variety of chè is bewildering: menus commonly list over 30 kinds. I ordered two different chè at each place I visited, but I still barely scratched the surface. To get familiar with chè varieties, see this excellent rundown on Wikipedia. Of all the aspects of Vietnamese cuisine, chè is the one most overlooked by foreign travellers and expats. Why? A big reason is texture: unctuous, gooey, sloppy, soggy, slimy – chè reminds most people of school dinners. But get past this and you’ll peel back another layer of Vietnamese food culture. Chè is fun food: fun ingredients, fun creations, fun names: fun times. During my research, I fell for it. Occupying the corner of an old apartment complex that, despite its dilapidated state, is abuzz with life, Chè Khánh Vy is a classic Saigon street food star. Lit by a naked light bulb hanging from a bare concrete overhang, the damp-ridden walls, cracked paving stones, and dozen or so low plastic tables, all point to great things. And that’s exactly what you get at Khánh Vy: over 30 years, and three generations of chè artistry; this place is a treasure trove of desserts. The friendly owners preside over a impressive array of large pots and pans, filled with gooey, slimy chè varieties. 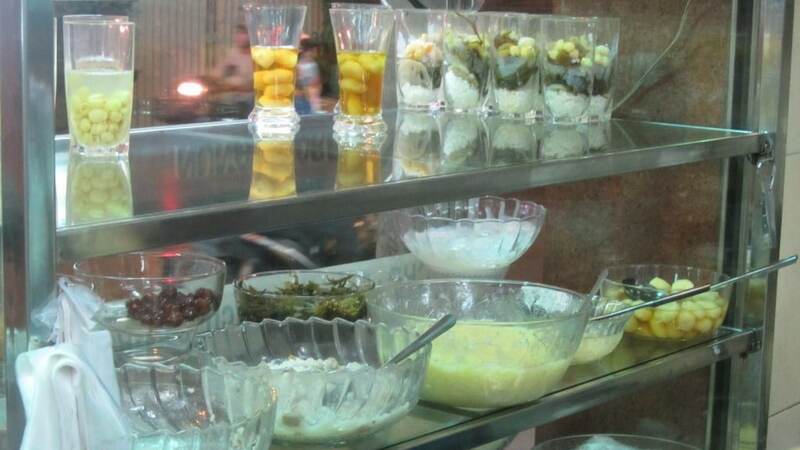 The speciality is chè mâm 16 món, which is a selection of 16 small bowls of chè – fantastic if you’re in a group. Since there are only two in my ‘group’, I order bà ba – a heavy, starchy combination of sweet potato, cassava and taro in a rich coconut milk gravy – and bánh flan, which is essentially a crème caramel; a legacy of French colonial times. A young local crowd hunch over their tiny bowls on their tiny stools: this dark corner echoes to the sound of their chatter. What a place! But its future is in doubt, as the apartment building is due for demolition very soon. 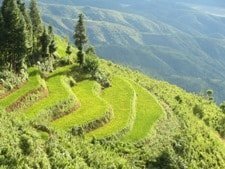 What next for Chè Khánh Vy? Bristling with youth, Chè Mỹ offers a dizzying variety of excellent quality chè at low prices. 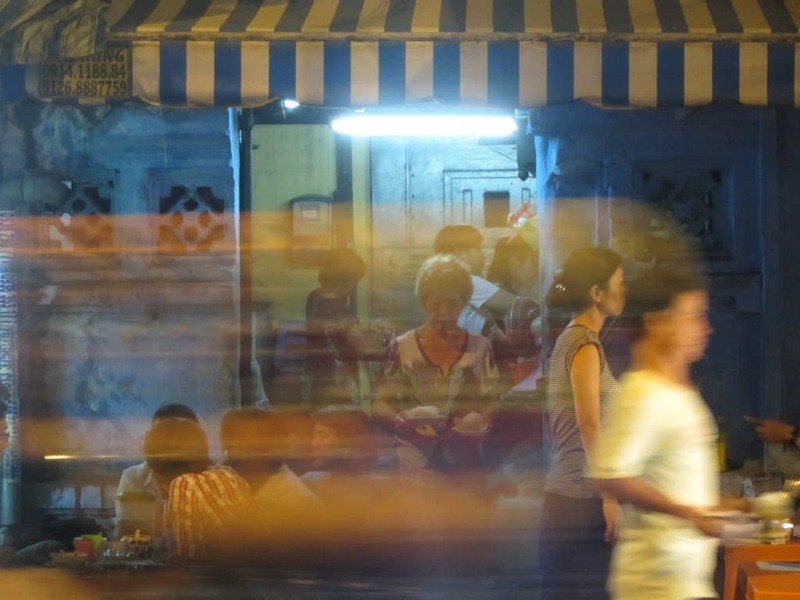 The neon-lit exterior draws Saigon’s youth off their motorbikes and into the fluorescent-lit interior, where they sit on plastic stools at metallic tables. The chè is fresh, colourful, and crisp. I order the house speciality: chè mỹ is a wonderful study in colour and texture, with exotic fruits and candies floating in creamy coconut milk. My second course is sâm bổ lượng, a sinister looking glass of strange shapes and dark brooding colours, like a nutty professor’s secret experiment. 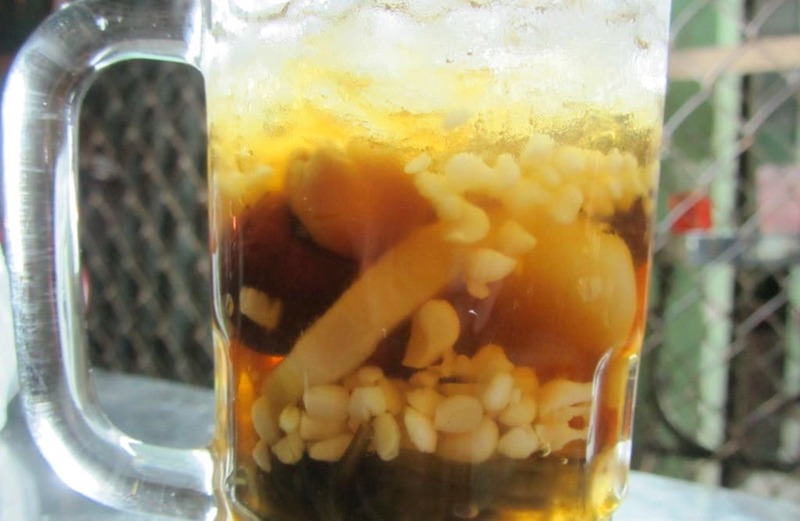 Filled with mysterious ingredients – Job’s tears, lotus seeds, red jujube berries, seaweed, ginseng – this chè is said to have medicinal qualities. It’s refreshing and sweet. Also on the menu is cơm rượu, a mildly alcoholic chè made from fermented rice, similar to the rice wine pudding I’ve tried in northern Vietnam. Named after the electricity pylon that graces the sidewalk outside, Chè Cột Điện is a diminutive old shophouse, whose faded indigo walls have somehow survived the last two decades of construction. 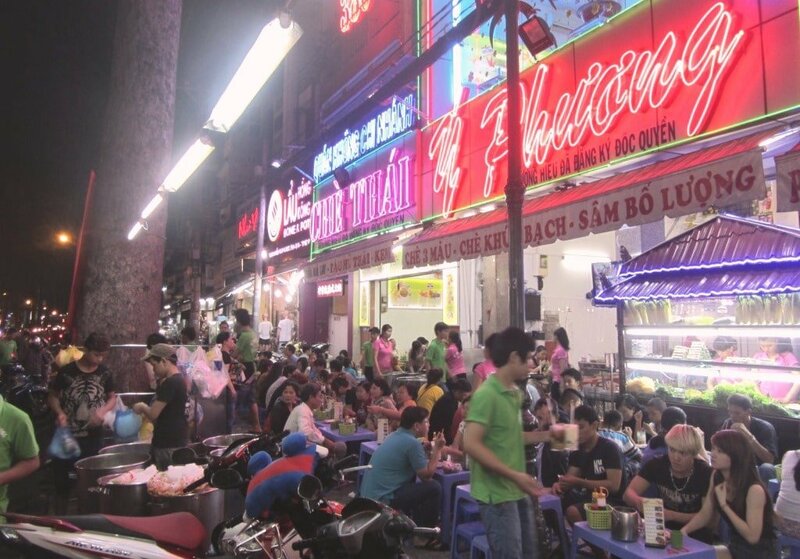 This is Chinatown and, even in a city as buzzing as Saigon, Chinatown cranks it up to 11. 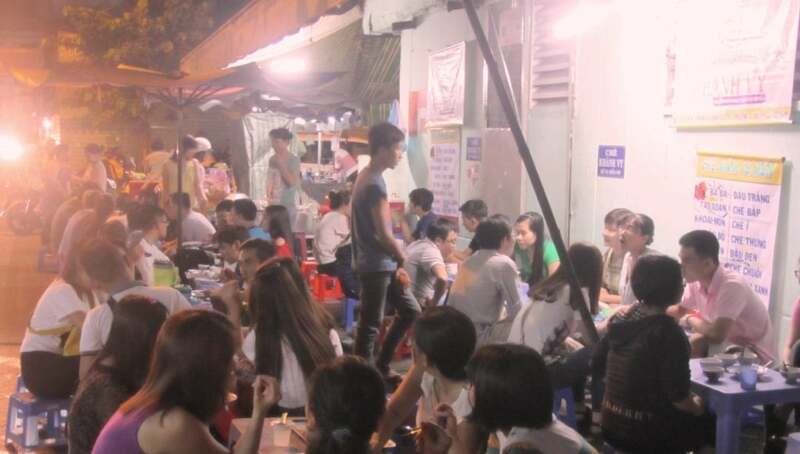 The ancient house may be on its last legs, but Chè Cột Điện is as popular as ever: for 70 years it’s been in operation, and still local people of all ages flock here – tables and chairs extend along the sidewalk for a block. Inside the old house, a gaggle of women – from their early twenties to their late seventies – run the show. Under the rotting wooden rafters, there’s what can only be described as a chè laboratory: pots, pans, jars, bowls, and cups all filled with mysterious and fragrant potions. From the menu – in Vietnamese and Chinese – I order two of the least familiar varieties I can find. Served in attractive ceramic bowls, I tuck into chè quy linh cao mật ông and chè bo bo hủ ky trứng cút. Although I have only a vague idea of what these are, I learn that the former is a jelly made from honey and seaweed, and is purported to make my skin more beautiful, which is always a good thing. And the latter contains coconut milk, quail eggs, and Job’s tears, which are grain-like berries, suspiciously similar to Sugar Puffs. Both are cooling and surprisingly light. But it wouldn’t matter if the chè were only average quality: just being here is good enough. Popular to the point of being swamped, Chè Thái Ý Phương is worth a visit just for the atmosphere if not for the chè. Set under large old trees on one of Saigon’s busiest and best food streets, Ý Phương has been running for 30 years. A beacon of neon in the Saigon night, Ý Phương is a giant establishment, which packs hundreds of dessert diners each night. The speciality is chè Thái which, as the name suggests, has its roots in Thailand. It’s fruity, sweet, and packed with candied, jellied bits and pieces, bobbing up and down in coconut milk. I also order chè khức bạch, a famously delicate bowl of jellied coconut milk, cream, and crunchy slices of roasted almonds. Neither chè is great to look at, but both are pretty tasty. In general, this place is all about the ambience, not the food. 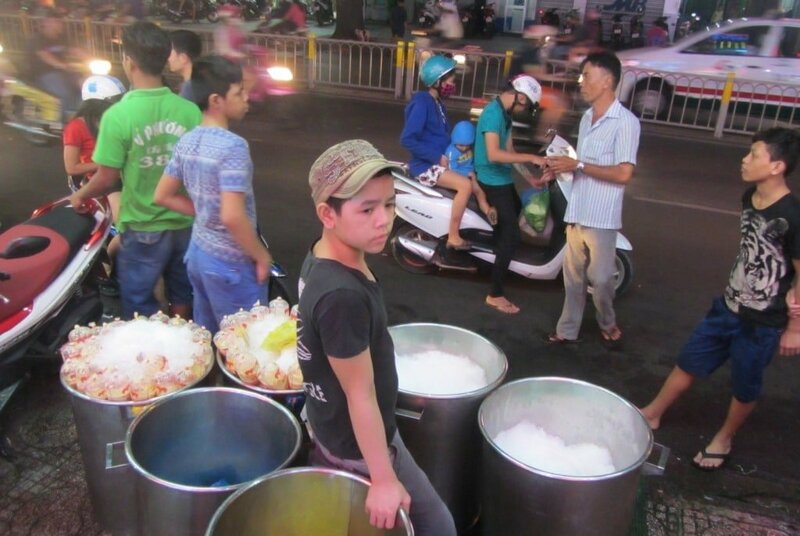 There’s a roaring take-away trade, which involves big vats of shaved ice on the sidewalk. This drive-thru operation is ‘manned’ by a young kid, who hands out plastic bags of chè to customers who swing by on their motorbikes. Located on a street corner – under a nest of tangled electricity cables and a street lamp – Chè Ông Mập may look like a small, insignificant business, but this place does a roaring trade, and has done so for around 50 years. Specializing in hot chè, it’s an intimate spot where customers huddle around saucepans of warm pudding. 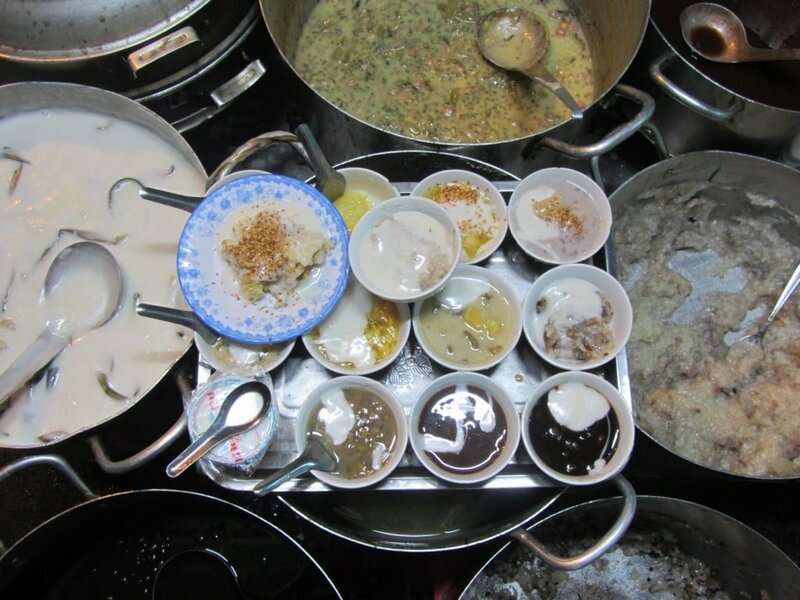 At the centre of this street kitchen sits Ms Điệp, a fiercely welcoming, chattering, barking, laughing island of a woman. Chè plays second fiddle to Ms Điệp’s giant personality. In perpetual motion, she swoops and scoops over the pots and pans, serving multiple portions in a matter of seconds, while engaging customers and passersby in banter. 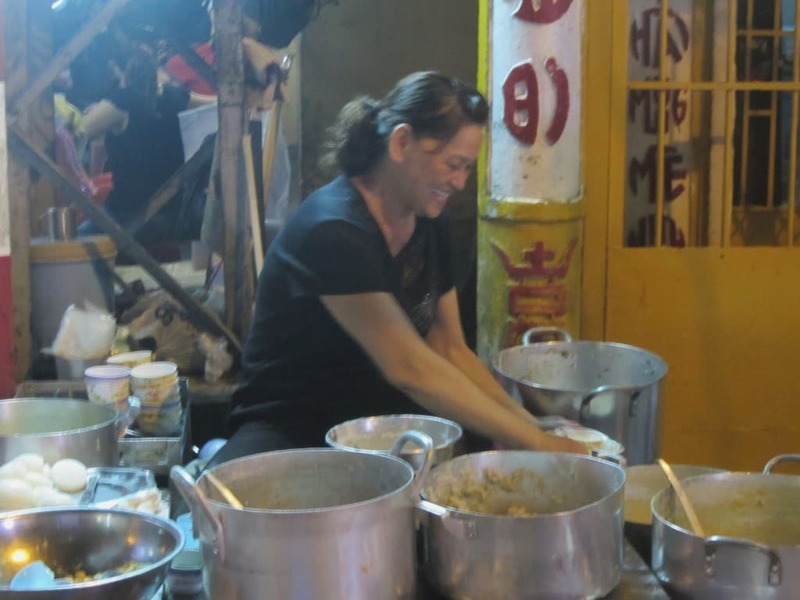 She’s a multi-tasking, multi-tentacled force of nature; a classic Saigon street food star. I order chè chuối nướng – grilled banana and tapioca pudding – and chè đậu trắng, which is a stodgy assortment of black-eyed beans and sweet sticky rice. Both are silky, creamy, sloppy and crunchy. Try to get here early in the evening, because she only serves while stocks last: on my first visit, at 9pm, she’d already run out. A substantial building with seating on two floors and an encyclopedic menu of chè varieties, Chè 75 is run by a lovely older couple, with smiles that warm your soul. 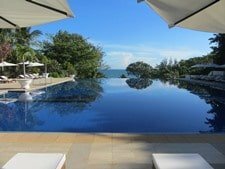 Although this place attracts a slightly older, more affluent crowd – it’s especially popular with families – the prices are still very reasonable and there’s plenty of atmosphere. There’s even a very admirable attempt at an English translation of their enormous menu – a task I would have thought impossible. 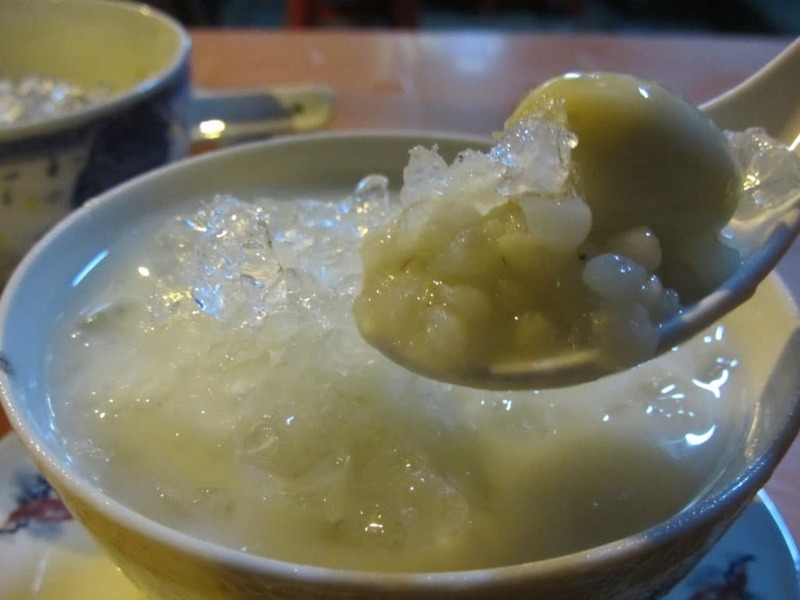 One of the house specialities is rau câu trái dừa – a young coconut whose juice has been jellified. It’s surprisingly tasteless, but when mixed with the flesh of the coconut it gains some flavour, and is famed for being cooling and refreshing. 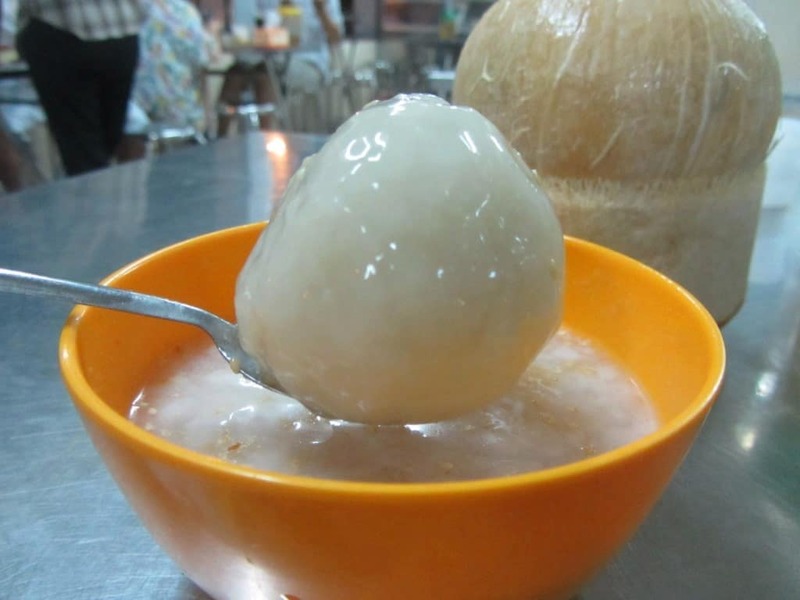 I also order chè trôi nước, which is one of those fun varieties of chè: a big, gelatinous ball of goo floating in a warm bath of slimy coconut milk, sprinkled with sesame seeds. There’s a delicious ginger tang to this chè, and I really enjoy sinking my teeth into the giant orb. Chè 75 has been going for 25 years, and continues to prosper. With a prime spot in the frenetic food court of Bến Thành Market, Bé Chè is another long-running (50 years) Saigon food stall. It’s heaving at lunch time, when shoppers, market workers, and a few adventurous tourists jostle for space around this colourful shrine to chè. Behind the glass cabinet there’s an entire library of chè: a hypnotic display of beans, grains, candies, seeds and vivid, bold colours. A fantastic illustrated menu in English and Vietnamese (with prices) makes Bé Chè very accessible to travellers: in fact, a glass of chè here is probably the most rewarding thing any visitor could do at Bến Thành Market. It’s a shame, however, that the women in charge of the stall have a tendency to be gruff and grumpy. But the presentation and quality more than make up for it. I order chè sương sa hột lựu, an electric, luminous glass of candied fruit in a coconut milk that is particularly flavoursome. The glass is full of slithery, wiggly, wormy things that could well be alive, for all I know. My second glass is chè hột sen, lotus seeds on ice. This takes me completely by surprise: lotus seeds are often rather bitter, but chè hột sen is flowery, fragrant, and sweet – it’s like drinking rosewater or the dew from from a jasmine flower: sublime. Served from a beautiful wooden cart with decorative carvings and colourful murals, Chè Lâm Vinh Mậu has been in business since the late 1950s. Back then, the cart was wheeled around the city – a mobile chè trolley, moving from street to street. Nowadays, it’s stationary, sitting on a quiet, dark street in central Saigon. Mr Hưng, 57, serves me. He’s been working here since he was a a young man. Hưng is disapproving when I tell him of all the other chè joints I’ve visited in the city. He insists that his chè is the best, and backs this up by offering me tasters of each of the varieties on the cart. After that, I order the house speciality, chè đậu hủ hạnh nhân – a gelatinous almond flan in a sweet, clear syrup. It’s subtle, cool and refreshing – what Vietnamese would call mát lạnh. The almond flavour comes as a nutty aftertaste. 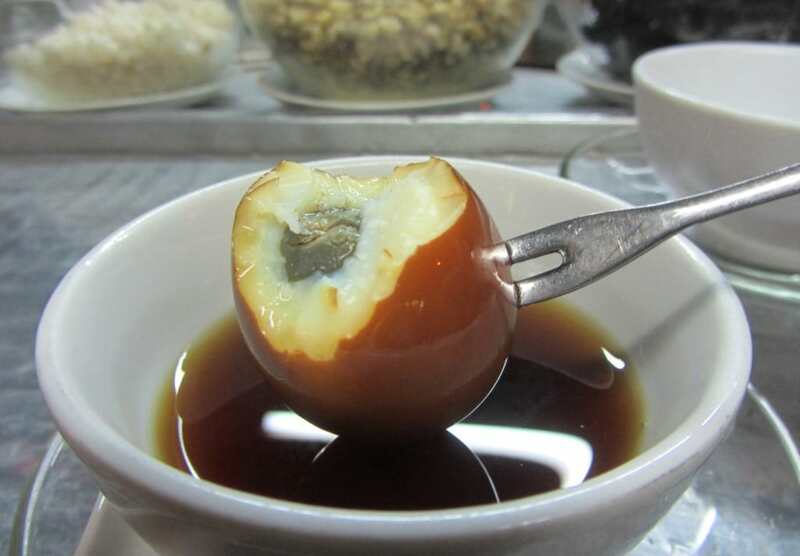 Next I try the weirdest chè I can see on display: chè trứng gà hồng trà, literally chicken’s egg in pink tea. Strange as it may sound, I loved this chè, perhaps more than any other I’ve tried. The tea is hot, the egg is boiled, and somehow they come together harmoniously. It’s comforting, warm, nourishing, and there are notes of tobacco in the tea. For more on Chè Lâm Vinh Mậu take a look at this video by Saigoneer and Only in Saigon. Ms Lộc and her husband have been operating this small chè cart for 30 years. On the corner of a busy intersection near central Saigon, she says the work is hard, but the tradition of chè in her family is strong. 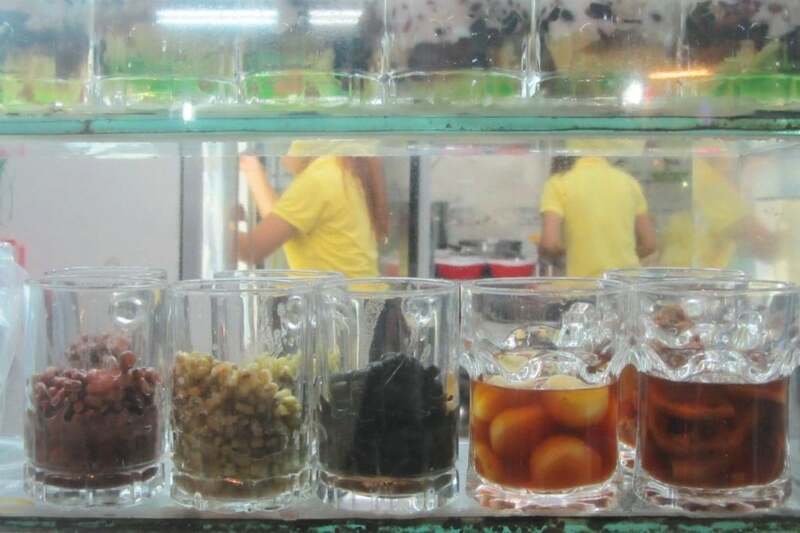 From her tiny chè trolley, Ms Lộc spoons out over a dozen varieties of chè to passersby on foot or on motorbikes. 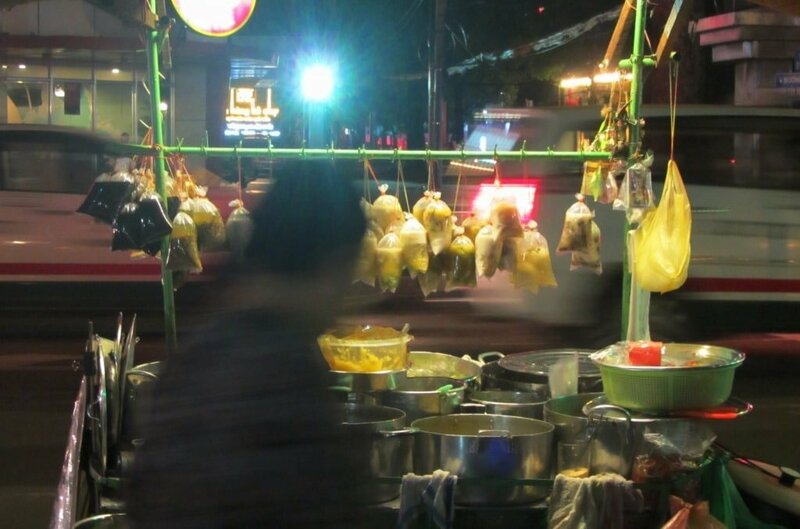 An array of saucepans showcase fresh and bright concoctions, many of which are ladled into plastic bags and hung from the trolley, awaiting take-away customers. I order chè thưng – a combination of root vegetables, mushrooms, and candied fruit in coconut milk – and chè bắp, which is a warm and comforting corn and rice pudding. The chè is sticky, dense, rich and served in plastic cups on small plastic stools: very informal; very Saigon. 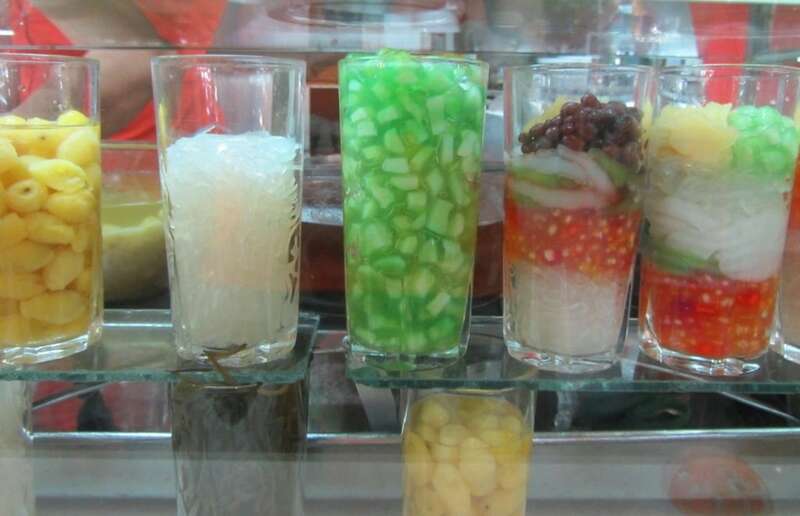 This entry was posted in ALL, Desserts, Drinks, FOOD & DRINK, Weird Food and tagged che, dessert, drink, food, guide, Ho Chi Minh City, Saigon, sweets, Vietnam. Bookmark the permalink. 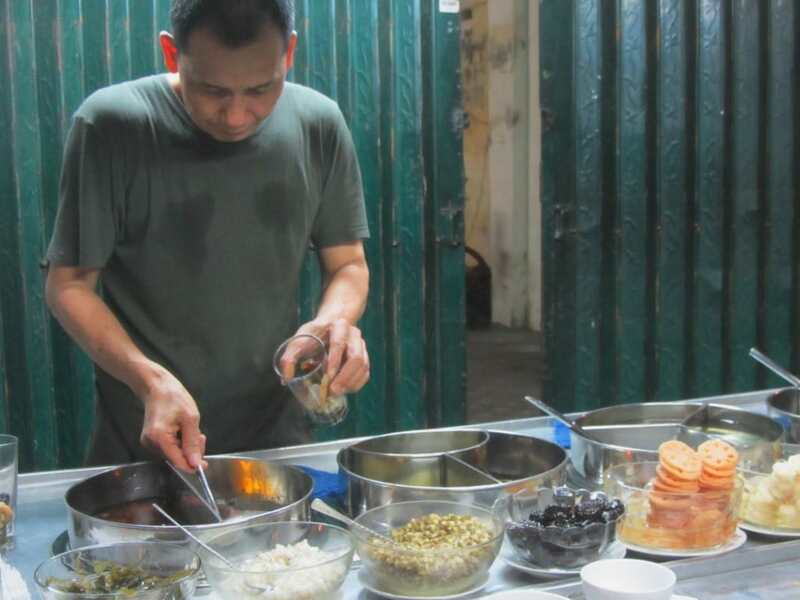 He used to sell only one type of chè – black beans with mung beans, but now he has expanded his menu to be more extensive, and they are all still very delicious. His chè uses natural sugar so you do not get the artificial after-taste in your mouth. They are also cheap, just 12,000 per cup. What’s more special about him is how he has overcome adversity and continue to be positive about life. I always have a nice talk and a good laugh with him by the chè stall. You can find him by the corner of Nguyen Van Thu and Mai Thi Luu street, he sells from 12 pm to around 6pm everyday except Sunday. He’s very easily recognisable. I hope you give him a visit sometimes and find a good cup of chè together with some joy. Thank you for your message. 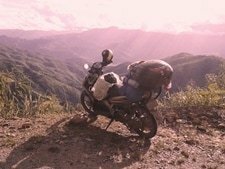 I’m glad to hear you enjoy che too 🙂 I hope you get to try some more of the places in this guide. Thanks for the recommendation – sounds very interesting. I will try to go there sometime soon. Hi! 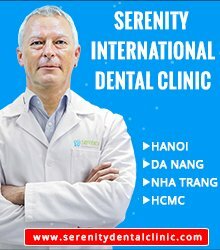 I’m a massive chè fan and I’ve just moved to Saigon from Hanoi. I’ve already been to a few places down here but I’m going to check all of these out asap. I’m looking forward to more weird and wonderful flavours 🙂 Thanks! That’s great. I hope you enjoy them! Do you remember which place had the biggest offer on che? So the most varieties? They all have quite a lot of varieties. Perhaps Che My and Che 75 have the most options. I had never heard of chè, but after reading this article I tried it, and love it! Thanks for the write up! Great! I love the photos Tom! I can’t wait for my next trip to Saigon…I typically don’t have a sweet tooth but from what I see here, this is a perfect dessert for me! I am reading this at 7am here in US and my mouth is watering and now the cravings begin! 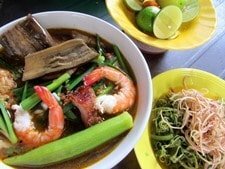 Thanks for the post, I want to try “chè trứng gà hồng trà” at quán chè Lâm Vinh Mậu since you said this is your most favourite of all chè. This Chè is actually originated from China. 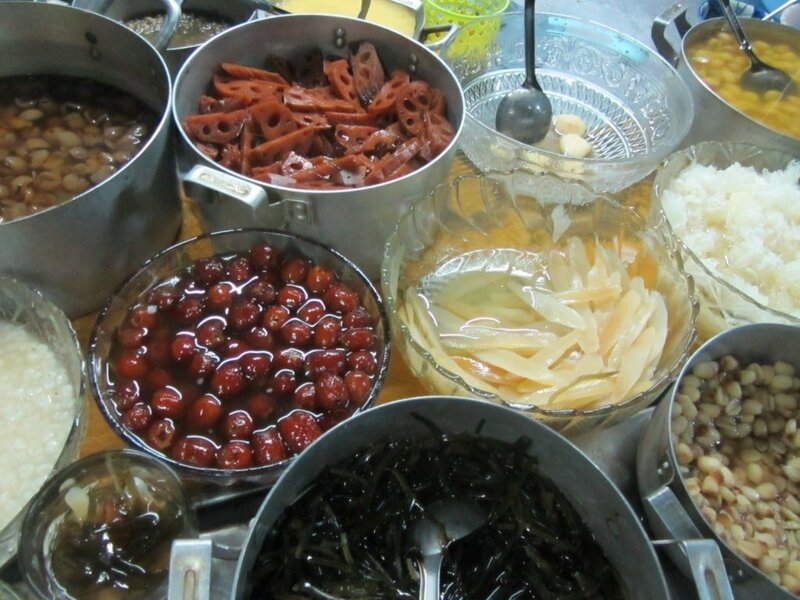 It is also a speciality of Shanghai which is recommended to tourists who visit the city. Yes, that was definitely one of my favourites, partly because I didn’t expect it to be 🙂 I had heard that it’s Chinese-style chè. Apparently, the owner’s father was from China. You can watch the video in the link in this article about Chè Lâm Vinh Mậu. I remember you once said that you were not very interested in che but you did a very good job on this article. As a che-lover, I think that these che stalls above are all excellent and qualified for me :). I recommend one more place where they serve Cambodian che. It’s located inside the flower market, Hồ Thị Kỷ market. If you like the durian smell, you’ll love che there since they’re really unique and delicate. I’m glad you like the places in this article. 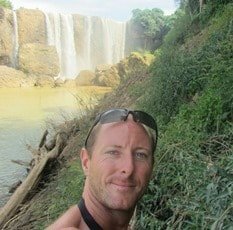 I have tried the Cambodian chè place on Hồ Thị Kỷ years ago. I liked it but forgot to mention it in this article, so thank you for reminding me.